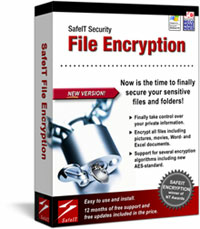 SafeIT File Encryption protects your files. SafeIT File Encryption is a user-friendly program that allows you to prevent unauthorized access to restricted documents. Encrypt sensitive documents and other private digital information you have on your computer. Ideal for e-mail attachments. SafeIT File Encryption is a user-friendly program that allows you to prevent unauthorized access to restricted documents. Encrypt sensitive documents and other private digital information you have on your computer. 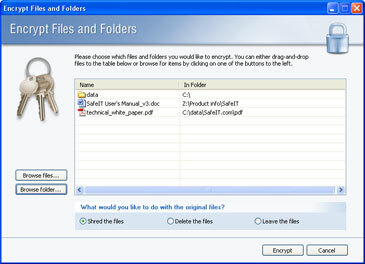 The encrypted files are are only accessible by entering the correct password. Ideal for encrypting e-mail attachments as it doesn't require any additional software from the recipient. You can decrypt the files on other plattforms than Windows. Choose format between ZIP, SAFE, EXE, JAVA or HTML. The encryption technology used supports several encryption algorithms, including the new AES-standard Rijndael with key length of 256 bits. If you prefer, you can also use Blowfish with a key length of 480 bits.